BAPCO launched its current five-year strategic plan in 2010 with the main focus on refinery expansion, enhanced trading in the international markets, improved human resource policies and processes, and the intensification of oil and gas exploration activities in the country. Under the current strategic plan, Bapco has been able to effectively achieve a crude supply agreement to secure future feedstock for many years ahead. The biggest achievement of the current strategic plan was the excellent progress in forwarding Operational Excellence Management Systems (OEMS) successful implementation of performance management. Bapco’s management systematically reviews all strategic activities to enable the plan to evolve and grow and also coordinates and aligns resources and actions with its mission, vision and strategy. 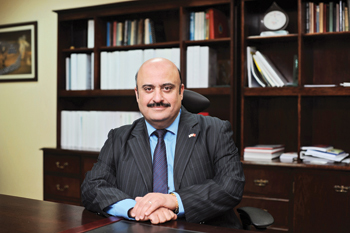 Bapco’s strategic environmental priorities, centered around its quest for full adherence to the regulatory compliance requirements of the Kingdom of Bahrain. The strong corporate environment health and safety (EHS) policy was articulated during 2014 via several projects and initiatives which promise an improved environmental footprint, as well as a more sustainable future for the company, the kingdom and all stakeholders. The Bahrain Distributed Solar Energy Pilot Project (BDSEPP) is an initiative to explore renewable energy options in order to reduce the kingdom’s dependence on oil and gas, and provide alternative sustainable energy solutions that will be beneficial not only in terms of reducing emissions and spurring economic growth, but also by ensuring that future generations can enjoy the continued availability of energy and conserve natural resources. BDSEPP is Bahrain’s first large-scale solar PV project to demonstrate the value and technology transfer of advanced US renewable energy solutions to Bahrain. The solar facilities combine smart-grid technology modules with traditional solar panels to enable command and control of large distributed solar energy systems, providing users with alerts, performance summaries, mesh networking diagnostics, problem identification and resolution features for the 5 megawatt (MW) solar installation distributed over Bapco refinery, Awali Township and the University of Bahrain. Implemented as part of Bapco’s Environmental Strategic Plan to meet strict regulatory compliance standards as stipulated by the kingdom’s Supreme Council for the Environment (SCE), the $120 million Waste Water Treatment Plant (WWTP) project was successfully tested and handed over to Operation and Maintenance (O&M) contractor CH2MHILL during the year. 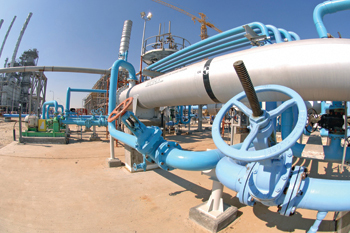 In recognition of the superior technical attributes of the project, which treats 4,400 US gallons per minute of refinery wastewater to industrial reuse standard via as four-stage membrane bio-reactor (MBR) process to meet very stringent nitrogen and phosphorus discharge limits, the global water industry conferred the prestigious ‘Industrial Water Project of the Year’ Award on the WWTP during the Global Water Summit 2014 in Paris in April. Furthermore, the project won the ‘Meed Quality Project of the Year 2014’ and ‘Meed Sustainable Project of the Year 2014 for the GCC’. Commissioning and operational start-up was achieved during the year for the plant, which is owned and operated by leading local industrial gases company Yateem Oxygen. The plant captures up to 200 metric tonnes per day of CO2, generated by the Bapco refinery, which was previously burned and vented to the atmosphere, and converts it into a valuable by-product used in particular in the medical and food industries. Two six-monthly ISO14001 environmental compliance surveillance audits, covering 24 different areas within the Refinery, Sitra and Wharf sites, were carried out by Bureau Veritas in January and June. These audits reconfirmed Bapco’s continued implementation of and adherence to all requirements specified within the ISO14001:2004 international standard for its Environmental Management System (EMS). A detailed action plan is being developed to address areas of improvement identified in the audit into 2015. A Feed contract was signed in September with project management, engineering and construction firm Technip Italy for the Bapco refinery expansion. The expansion involves the installation of several new units – including a new hydrocracking unit, fluid catalytic cracker and dehydrosulphurisation unit – to raise refining capacity by about 100,000 bpd to 365,000 bpd. Selected members of Bapco’s Feed management team were deployed to Technip’s Rome offices during the year, with the remainder due for mobilisation in the first quarter of 2015, where they will work on an accelerated schedule with the aim of completing Feed activities in early 2016. In September, Bapco selected Chevron Lummus Global (CLG) of the US to provide process technology for the new residue hydrocracking and hydrocracking units, being developed as part of the BMP. As part of the agreement, CLG will also produce the engineering design packages for the eventual installation of the two technologies, which will upgrade low value products to high value, high quality middle distillate products meeting globally stringent specifications. The two license agreements join existing agreements with UOP (for the diesel hydro treating unit) and Worley Parsons (for the sulphur recovery units). 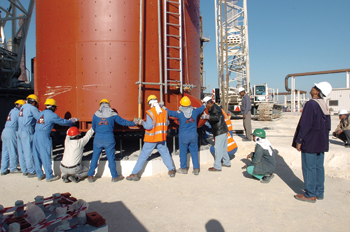 The A-B pipeline project team successfully completed all Feed work ahead of the engineering, procurement, and construction (EPC) phase of the project which involves the installation of a new 350,000 bpd capacity crude pipeline from Saudi Aramco’s Abqaiq Plant in Saudi Arabia to Bapco Refinery. Requests for Proposal (RFP) were reviewed and finalised by Bapco and Saudi Aramco in 2014 ahead of the bidding process for the three main contract packages in January 2015. 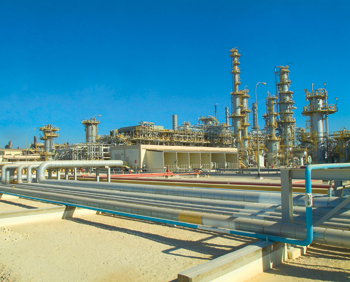 The pipeline, funding for which was approved by nogaholding during the year, will replace the ageing 235,000 bpd capacity line between Aramco and the Bapco refinery. Bapco provided technical, engineering and site selection support for this mega grassroots project, a joint venture between nogaholding and Petrochemical Industries Company of Kuwait. The project will add value to naphtha feed, supplied by the existing Bahrain refinery, by converting it into aromatics products. Some side liquid and gas streams will be routed back to the refinery. The most valuable one will be the hydrogen-rich off gas, where after purification it can contribute to satisfying the refinery’s hydrogen requirements. Bapco’s petroleum engineering knowhow was once again shared with Noga and nogaholding as the kingdom’s drive to add new onshore and offshore hydrocarbon reserves to its portfolio and enhance existing output gathered pace. A number of prospects were lined up for drilling in 2014, with a land rig leased to drill several wells to explore for both conventional and unconventional resources. 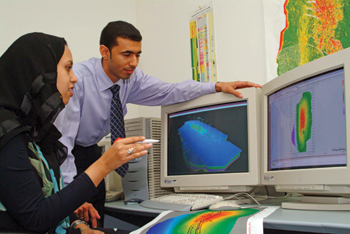 Furthermore, a geochemical survey was conducted by a consultancy firm in the south western region of Bahrain’s main island, to directly detect hydrocarbons and evaluate and firm up future exploration prospects. Preparatory work was initiated on a new offshore exploration bid round relating to four offshore exploration blocks relinquished by Occidental Petroleum of the US and Thailand’s PTTEP in 2012. Geological and geophysical evaluation of the four blocks was undertaken in 2014 by three international consultancies in close co-ordination with and under the direct supervision of Bapco, with the ultimate objective of upgrading block prospects to attract the interest of international oil companies. The analysis confirmed several areas with interesting exploration potential, and a new offshore exploration bid round for the blocks is planned during 2015. 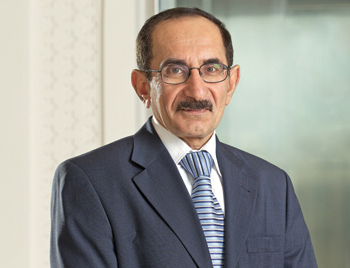 The company launched a study during the year to evaluate the exploration potential of unconventional resources in Bahrain. In this regard, a US-based consultant was engaged to conduct the appraisal, with the aim of better understanding of both onshore and offshore unconventional play concepts within Bahrain’s sovereign territory. The consultant proposed some locations for appraisal drilling and estimated definitive and probable hydrocarbon resources, and the prognosis was reasonably encouraging. Bapco continues to provide technical support, follow up and monitoring for the Noga-led Deep Gas Initiative, which is being spearheaded in partnership with Occidental Petroleum. Following completion of the project design stage, during the year an Occidental-Bapco joint subcommittee initiated procurement and contract awards for drilling materials, drilling rig, logging and fracking services. The first exploratory well was spudded in July 2014 to below the Khuff formations. Despite the challenging high pressure, high temperature environment, early indications were encouraging. Drilling operations are expected to be completed in early 2015, after which hydraulic fracking will be initiated to evaluate the production potential of deep reservoir targets. Under the terms of a key partnership agreement, the company continues to monitor the activities of Tatweer, the operator of the onshore Bahrain oilfield with a mandate to raise field output and discover new hydrocarbon reserves. During 2014 Bapco evaluated some of the investment projects which Tatweer is undertaking to delineate the field and recover additional reserves through enhanced oil recovery (EOR) methods.